Our food contains two dietary forms of iron, non-heme iron and heme iron. Approximately 90% of iron intake comes from non-heme iron, and only a small portion, 10%, comes from heme iron13,14. occurs naturally in animal sources (beef, pork, fish, poultry) and is a key source of dietary iron. It is derived from hemoglobin (in red blood cells) and myoglobin (in muscle tissue), oxygen-binding proteins that contain heme. Heme iron’s relative importance is attributable to its high bioavailability15. Heme iron is the most effective source of iron for people who have an iron deficiency16. High bioavailability17: absorption of 15-45%19, average absorption of 25%20. Absorption is more efficient18 and not influenced by dietary factors and gastric acid17. Different absorption mechanism18. Heme iron is absorbed as a whole unit, thus no free iron ions are present in the gut. Unabsorbed heme iron does not cause side effects. is present in plant-based foods (vegetables, nuts, beans, whole grain, fruit) and represents most of the iron that humans consume in their diets. Non-heme is also the type of iron commonly found in traditional iron food supplements. However, due to its poor ability to dissolve in the bowel, only a small fraction reaches the blood. Consequently, its bioavailability is very low. Low bioavailability: absorption of 1-15%19, average absorption of 5%21. Absorption is less efficient and is influenced by gastric acid and dietary factors (tea, coffee, cereals,…)18. Traditional iron supplements contain high amounts of non-heme iron which often cause gastrointestinal side effects (e.g. nausea, vomiting, gastric pain, diarrhea, constipation) cause side effects. 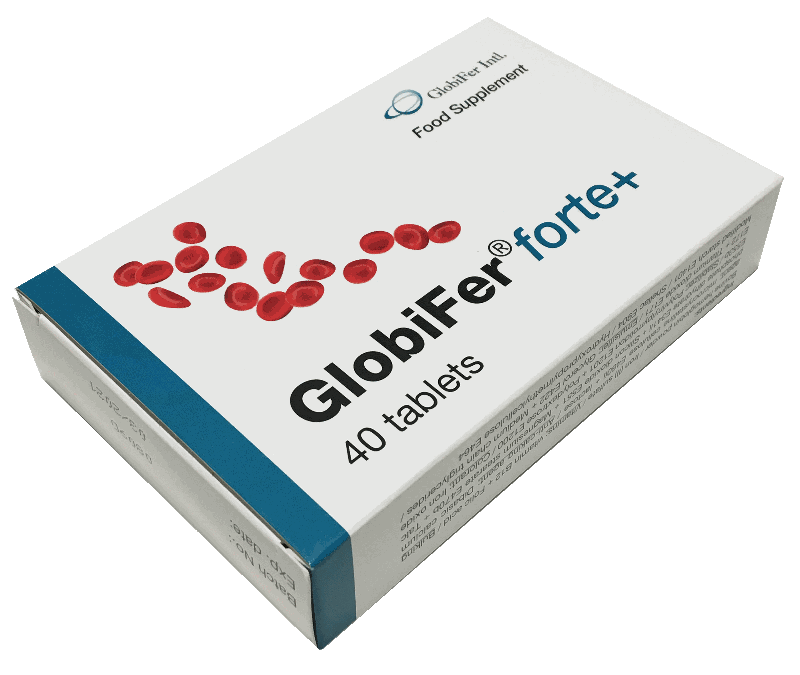 GlobiFer® is a natural food supplement with a unique low-dose iron formulation containing both heme and non-heme iron, to quickly and efficiently correct iron deficiency and to help maintain the hemoglobin level. The addition of heme iron increases iron absorption. Less iron is required for supplementation, reducing side effects. Clinical studies have demonstrated an optimal clinical response with an average increase in hemoglobin of 30 g/L and improved iron stores. Side effects are similar to placebo, leading to better compliance. Reassuringly, GlobiFer® also shows high customer satisfaction1,2. The iron content of traditional high-dose iron supplements is usually much higher than the UL (= Tolerable Upper Intake Level for adults is 45 mg/day of iron), above which unpleasant side-effects start appearing. Thanks to the addition of heme iron to GlobiFer®, less non-heme iron is required. Even with 2 tablets of GlobiFer® forte per day, the iron level stays well below the UL, resulting in good tolerability. How much iron you need each day depends on your age, gender, and overall health. Young children need more iron than adults, in general, because their bodies are growing so quickly. Starting at adolescence, a woman's daily iron needs also increase. Women need more iron because they lose blood each month during their period. In some special circumstances (pregnancy, vegetarian or vegan diets, certain medical conditions) the body's iron needs also increase. Iron deficiency and iron-deficiency anemia are conditions that can occur on their own or as a symptom of many other serious medical issues. 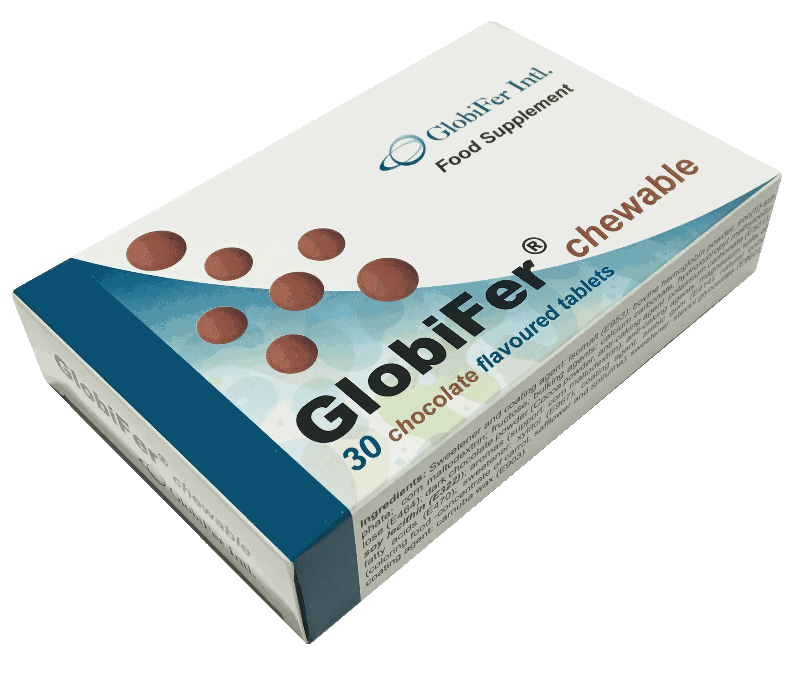 GlobiFer® offers unique fortified heme iron supplements to rebalance your iron. Are you interested in distributing GlobiFer® in your country? Feel free to contact us. GlobiFer Intl. is looking for distributors all over the world. 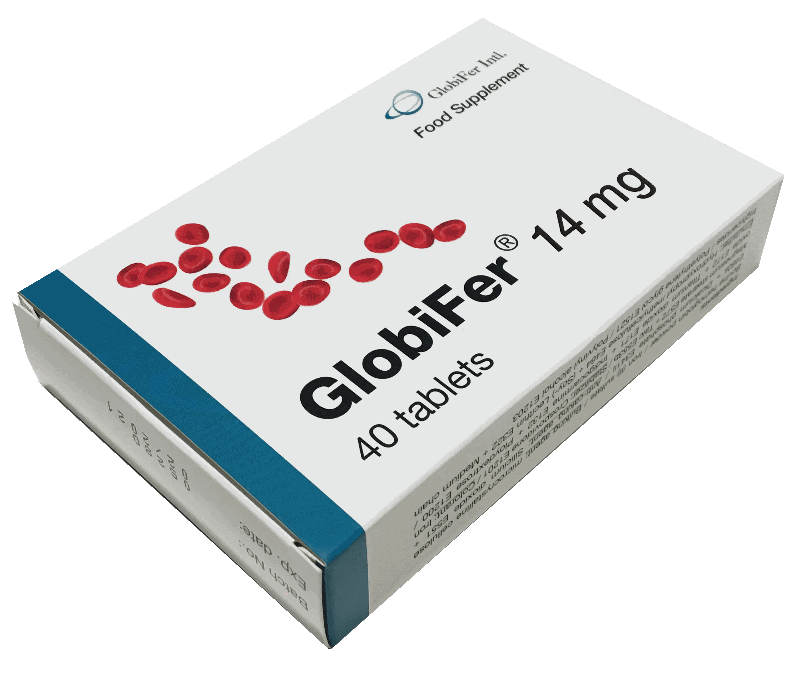 GlobiFer® is on the market since 2013. The original concept was developed in the early 80's by a Swedish hematologist at the Karonlinska Hospital in Stockholm, Sweden. Currently our products are available in 23 countries. GlobiFer Intl. is continually investing in further growth in new and existing markets. In a world where it is all about healthy lifestyle, GlobiFer® has been constantly developing innovative products to keep your iron levels balanced. Website visitors are cautioned to use their own (professional) judgement and consult any other appropriate sources prior to making clinical judgments based on the content of this website.